Samsung just announced Galaxy Tab S5e (SM-T725), the company’s latest tablet. It has a 10.5-inch Super AMOLED WQXGA screen, is powered by an Octa-Core SoC and runs on Android 9.0 (Pie). It has quad-stereo speakers tuned by AKG by HARMAN, similar to the Tab S, but it doesn’t have an S Pen or Iris scanner. 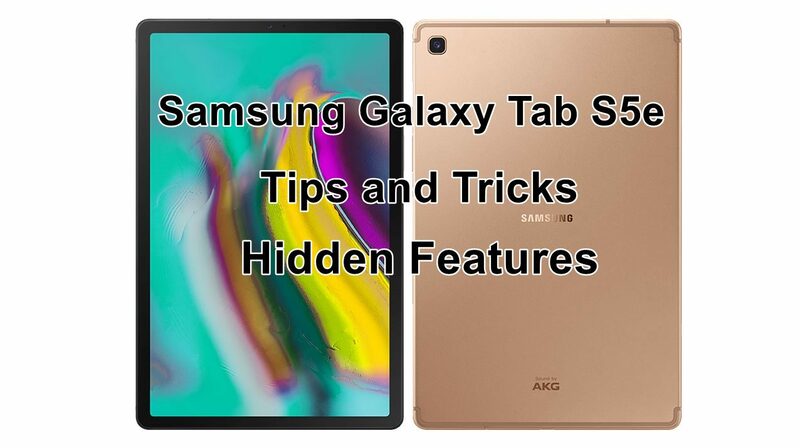 If you are wondering Galaxy Tab S5e Tips and Tricks or Hidden Features so today we are talking about Galaxy Tab S5e Hidden Features. If you are wondering what is the Galaxy Tab S5e Hidden Features. Today we are talking about Unique Hidden features of Galaxy Tab S5e Android Pie based on One UI. This is a very useful feature when you disable screen rotation from the notification panel because maybe you’re laying down and don’t want to display to rotate on accidental movements but still want to watch and see some content in landscape. Well you will the small icon will pop up bottom of your Tab mobile screen corner when you rotate the phone. So it is suggesting you rotate the screen for only that specific app when you click it that app will rotate in landscape. The rest of the apps will still run normal mode you will get this suggestion every time you rotate the phone, there is no setting to activate this. It will be automatically activated when you disable screen rotation. The second awesome feature is lift to wake up the phone and combining it with another feature I will tell you about in this article you get a good way to unlock the device. You can find the Lift to wake gesture option in the Advanced features » Motions and gestures menu in the phone’s Settings app. When you activate it you will be able to turn on the display by lifting the Tab from the table or getting an out from your pocket without pressing any buttons. If you combined this with an intelligent scan option that allows the scan to be activated automatically when the screen turns on. this way when you lift the phone it will be automatically unlocked. The third feature is about locking the home layout which mean you will not accidentally move the apps or folders from their place or to delete them from the home screen to activate this go to settings> Display> Home Screen and activate lock home screen layout. This way you will never worry about losing apps from the home screen or somebody else messing with it. The fourth one is about the always-on-display. You already know that you can activate or disable it but this Samsung allows to activate it and only see it when you tap the display while it was off. It comes helpful when you sometime need those always-on affirmation but don’t want to drain the battery. You can find this in the Settings> Lock Screen> Always On Display, enter there then activate it then go to display mode and choose the the tap to show option. The next feature is spinning an app it means opening an app and pinning it to the screen. This way it will not be accidentally closed because no button on the tab we close it, this will prevent others from using other features outside the app and also messages and calls are blocked when an app is pinned. In order to close the app you need to press and hold simmers down you see the back and recent apps soft buttons. To activate this feature Go to the settings> Biometrics and security> Other Security settings> Pin windows. After that if you want any app to be pinned just open it for normal use then press the recent app button press the app icon at the top and choose pin this app. This is the home screen for kids that you can simply activate from the notification panel. You get the color red screen with kids friendly icons and only apps and games design it for kids. Samsung provided the on-screen navigation on the One UI with a new dimension. Not only can you hide the navigation bar – like on all recent Samsung phones – but you can keep navigating without removing the bar. Go to Display in the Settings, scroll down a bit and choose Navigation bar> Full-screen gestures option. To switch to gesture navigation, make sure the Show and Hide button is on, and choose the Actions for Start, Back and Recent option. Then, at the bottom left, tap the ‘dot’ that hides the navigation bar. I hope you understand Samsung Galaxy Tab S5e Tips and Tricks or Hidden Features. If you have any problem then ask in the comment box. We can solve your problem.